This is a case report of a 59 years old male who had a commercial non-related living renal transplantation for his end stage renal insufficiency secondary to adult polycystic kidney disease. He suffered an immediate and early post-operative bleeding, which was managed conservatively. He was presented at Sultan Qaboos University Hospital four months after his transplant with abdominal pain, nausea, loss of appetite and a rise in serum creatinine levels. Ultrasonography and angiography have shown a 4 cm false aneurysm of the transplant renal artery at the anastomotic site with the external iliac artery. Surgical exploration with resection of the false aneurysm and reanastomosis of the donor renal artery to the external iliac artery was carried out successfully with preservation of the renal allograft. This is a rare case of an extra-renal false aneurysm at the anastomotic site of the transplant renal artery to the external iliac artery four months after renal allotransplantation. Literature review on the management and outcome of false aneurysms after renal transplant was carried out. From the 1Department of Surgery, Vascular Unit; 2Urology Unit; 3Department of Radiology and Molecular Imaging; 4Department of Medicine, Nephrology Unit, Sultan Qaboos University Hospital, Muscat, Sultanate of Oman. Address correspondence and reprint request to: Dr. Khalifa Al-Wahaibi, MD, FRCSC Consultant, General and Vascular Surgery, Department of Surgery, Sultan Qaboos University Hospital, Al-Khod, Sultanate of Oman. Al-Wahaibi KN, Aquil S, Al-Sukaiti R, Al-Riyami A, Al-Busaidi Q. Tranplant renal artery false aneurysm: Case report and literature review. OMJ Oct 2010; 25(4):306-310. There was a wide communication with the arterial lumen and insufficient proximal landing zone to deploy an endovascular stent without compromising the lumen of the external iliac artery. The thrombin injection treatment would carry high risk of distal embolization given the wide communication with the arterial lumen. He was offered an open surgical repair. After obtaining an informed consent explaining the high risk for graft loss and possibility of allograft nephrectomy, the patient was taken to the operating room. Surgical exploration showed the aneurysmal mass at the transplanted kidney pedicle. Meticulous dissection isolated the false aneurysm from the transplanted kidney. Proximal and distal vascular control was obtained over the external iliac artery as well as the transplanted renal artery distal to the false aneurysm, (Fig. 3a). Intravenous heparin was given at a dose of 150 units per kilogram. Proximal and distal external iliac artery and the transplanted renal artery were clamped and resection of the false aneurysm was performed, (Fig. 3b). The transplanted renal artery was anastomosed primarily to the external iliac artery using a continuous non absorbable suture (Polypropylene) size 6-0. An open incisional biopsy was taken from the transplanted kidney to assess for possible ongoing allograft rejection. In the immediate post-operative period the patient was oliguric, which he subsequently recovered from. His serum creatinine improved to 140 micromoles per liter and his glomerular filtration rate improved to 50 ml/minute/ 1.73 meters square. His distal pulses on his right leg were normal. The patient was continued on immunosuppressive therapy and was discharged home on the seventh post-operative day. Figure 1a: B-mode Ultrasonography. 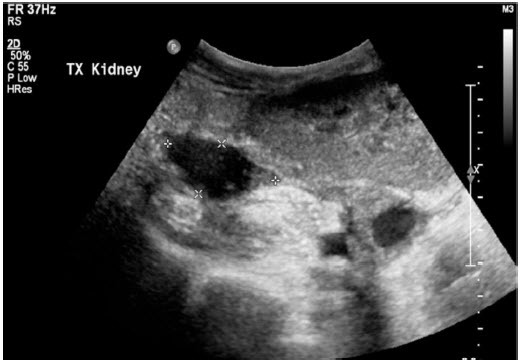 A hypoechoic mass with centrally anechoic lesion next to the upper pole of the renal allograft. Figure 1b: Color-Coded Doppler Sonography (CCDS) showed a pulsatile flow pattern in the central anechoic part of the lesion. 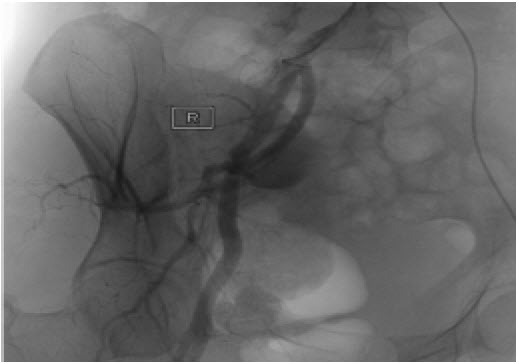 Figure 2a: Angiography has showed a 4x4 cm false aneurysm at the junction of the transplanted renal artery with the right sided external iliac artery. 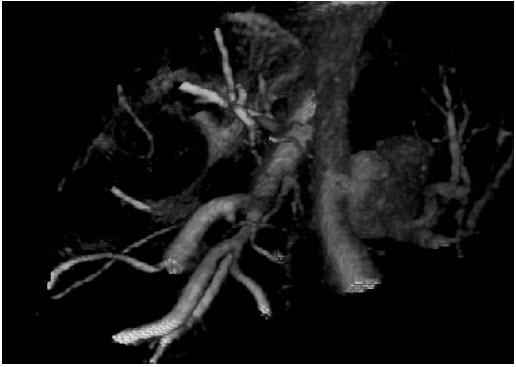 Figure 2b: 3 Dimensional Angiography reconstruction view showing the 4x4 cm false aneurysm at the junction of the transplanted renal artery with the right sided external iliac artery. 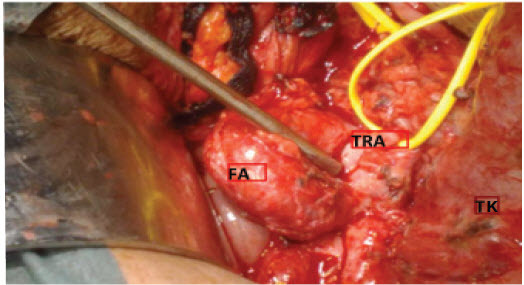 Figure 3a: Operative finding of the false aneurysm (FA), proximal and distal Vascular control over the right sided external iliac artery, vascular control over the transplanted renal artery (TRA). Transplanted Kidney (TK). Figure 3b: false aneurysm incised and then resected. Chronic kidney disease is a large and growing problem in Oman, as well as worldwide. It is attributed mainly to diabetic and hypertensive nephropathies. Other causes include glomerulonephritis, autoimmune diseases, obstructive nephropathies, inherited diseases such as polycystic kidney disease, congenital malformations and repeated urinary tract infections. With advanced stage of the chronic kidney disease, most patients will require substitutive treatment such as hemodialysis or peritoneal dialysis to survive. Patients with false aneurysms after their renal transplant are usually asymptomatic and they are diagnosed incidentally.20,21 Few are reported to present with fever, anemia, compression of adjacent structures, hypertension, functional impairment, graft loss and life threatening hemorrhage due to acute rupture.5,10,14,15,19,20,22-25 There are no identified physical findings specific to these false aneurysms. Physical examination should identify any existing tenderness, pulsatile masses, thrill or bruit. There is no documented existing size for developing symptoms. One can expect that the size of the false aneurysm is a direct factor to predict risk of rupture as well as other factors such as the rate of expansion or growth, the presence of active blood flow in the false aneurysm, weakness of the wall and existence of trauma, or radial force on the lesion. From the review of literature, there is no identified diameter to predict the risk of rupture of these rare lesions. Ultrasound-guided percutaneous thrombin injection (USG-PT) has been reported as an efficient and secure treatment option given the false aneurysm is accessible and not associated with infection.32,33 Also, it has been described in the treatment of a large anastomotic false aneurysm after failure of kidney transplant.34 Complications of thrombin injection are reported as rare, they include distal arterial embolization,35 and anaphylaxis reaction,36 and generalized urticaria,37 after using bovine thrombin. In the studied patient, it was important to intervene as the false aneurysm was 4 cm in diameter and the patient’s renal function was compromised. There was no sufficient proximal landing zone for endovascular stenting and the false aneurysm has a wide communication with the external iliac artery; which carries a high risk of distal embolization in case of using ultrasound-guided percutaneous thrombin injection (USG-PT). Our aim was to save the allograft which was achieved, and there was no need for allograft nephrectomy. Though rare, the development of an extra-renal false aneurysm of the transplant renal artery at the anastomotic site with the external iliac artery can carry a potentially devastating loss of allograft and the need for allograft nephrectomy. To date, there are no large series to define the exact etiology, natural history, management options or outcome of such complication. We present a patient with this rare complication which was diagnosed and successfully managed with an open surgical reconstruction. Clinical, biochemical as well as ultrasonographic follow-up examination confirmed successful therapeutic management of the patient. Less invasive endovascular techniques offer a new therapeutic option in this challenging scenario. We think that an open surgical reconstruction of a renal artery aneurysm, if feasible, is a safe and a durable procedure to save the renal allograft. We advocate a high index of suspicion, early clinical diagnosis and careful patient selection to a treatment option for better outcome of allograft and patient survival. Gerbens D, Teyssou H, Manteau G, Ruiz R, Bureau M, Tessier JP. [Ultrasonography and surgical complications after kidney transplants]. J Radiol June-July 1980; 61(6-7):405-410. Matas AJ, Payne WD, Sutherland DE, Humar A, Gruessner RW, Kandaswamy R, et al. 2,500 living donor kidney transplants: a single-center experience. Ann Surg August 2001; 234(2):149-164. Streeter EH, Little DM, Cranston DW, Morris PJ. The urological complications of renal transplantation: a series of 1535 patients. BJU Int November 2002; 90(7):627-634. Dimitroulis D, Bokos J, Zavos G, Nikiteas N, Karidis NP, Katsaronis P, et al. Vascular complications in renal transplantation: a single-center experience in 1367 renal transplantations and review of the literature. Transplant Proc June 2009; 41(5):1609-1614. Goldman MH, Tilney NL, Vineyard GC, Laks H, Kahan MG, Wilson RE. A twenty year survey of arterial complications of renal transplantation. Surg Gynecol Obstet November 1975; 141(5):758-760. Donckier V, De Pauw L, Ferreira J, Hanquinet S, Hooghe L, Janssen F, et al. False aneurysm after transplant nephrectomy. Report of two cases. Transplantation August 1995; 60(3):303-304. Koo CK, Rodger S, Baxter GM. Extra-renal pseudoaneurysm: an uncommon complication following renal transplantation. Clin Radiol November 1999; 54(11):755-758. Grenier N, Douws C, Morel D, Ferriére JM, Le Guillou M, Potaux L, et al. 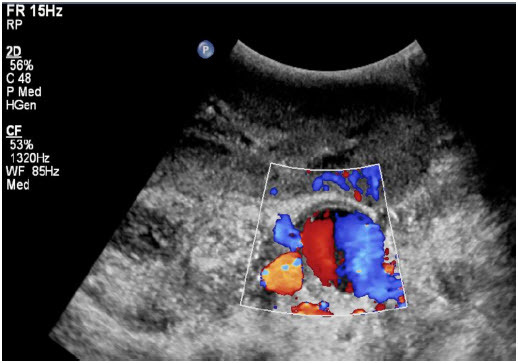 Detection of vascular complications in renal allografts with color Doppler flow imaging. Radiology January 1991; 178(1):217-223. Mazzucchi E, Nahas WC, Antonopoulos IM, Piovesan AC, Ianhez LE, Arap S. Surgical complications of graft nephrectomy in the modern transplant era. J Urol September 2003; 170(3):734-737. Gang S, Rajapurkar M. Vascular complications following renal Transplantation. Journal of Nephrology and Renal Transplantation. JNRT 2009; 2:122-132. Risaliti A, Sainz-Barriga M, Baccarani U, Adani GL, Montanaro D, Gropuzzo M, et al. [Surgical complications after kidney transplantation]. G Ital Nefrol January-February 2004; 21(Suppl 26):S43-S47. Salehipour M, Salahi H, Jalaeian H, Bahador A, Nikeghbalian S, Barzideh E, et al. Vascular complications following 1500 consecutive living and cadaveric donor renal transplantations: a single center study. Saudi J Kidney Dis Transpl July 2009; 20(4):570-572. Guleria S, Ahmad N, Pollard SG, Newstead CG, Lodge JP. Transplant renal artery aneurysm following venous patch repair of a traction injury to the renal artery. Nephrol Dial Transplant June 1998; 13(6):1577-1578. Burkey SH, Vazquez MA, Valentine RJ. De novo renal artery aneurysm presenting 6 years after transplantation: a complication of recurrent arterial stenosis? J Vasc Surg August 2000; 32(2):388-391. Nguan CY, Luke PP. Renal artery pseudoaneurysm of infectious etiology: a life-threatening complication after renal transplantation. Urology September 2006; 68(3):668-669. Baxter GM. Ultrasound of renal transplantation. Clin Radiol October 2001; 56(10):802-818. Luzzio CC, Waclawik AJ, Gallagher CL, Knechtle SJ. Iliac artery pseudoaneurysm following renal transplantation presenting as lumbosacral plexopathy. Transplantation April 1999; 67(7):1077-1078. Fujikata S, Tanji N, Iseda T, Ohoka H, Yokoyama M. Mycotic aneurysm of the renal transplant artery. Int J Urol June 2006; 13(6):820-823. McIntosh BC, Bakhos CT, Sweeney TF, DeNatale RW, Ferneini AM. Endovascular repair of transplant nephrectomy external iliac artery pseudoaneurysm. Conn Med September 2005; 69(8):465-466. Bracale UM, Carbone F, del Guercio L, Viola D, D’Armiento FP, Maurea S, et al. External iliac artery pseudoaneurysm complicating renal transplantation. Interact Cardiovasc Thorac Surg June 2009; 8(6):654-660. Martinez T, Palomares M, Bravo JA, Alvarez G, Galindo P, Entrena AG, et al. Biopsy-induced arteriovenous fistula and venous aneurysm in a renal transplant. Nephrol Dial Transplant November 1998; 13(11):2937-2939. Levi J, Zevin D, Barak I, Agmon M. Prolonged fever and anemia as the sole manifestations of a false aneurysm in a transplant patient. Isr J Med Sci November 1979; 15(11):910-912. Eng MM, Power RE, Hickey DP, Little DM. 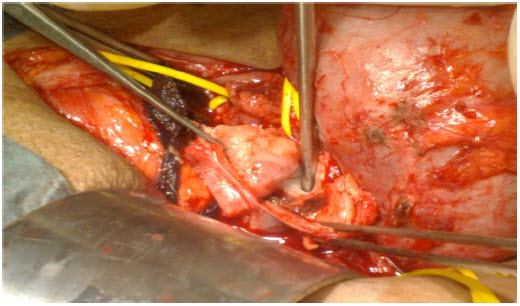 Vascular complications of allograft nephrectomy. Eur J Vasc Endovasc Surg August 2006; 32(2):212-216. Inoue T, Satoh S, Numakura K, Saito M, Tsuchiya N, Nanjo H, et al. 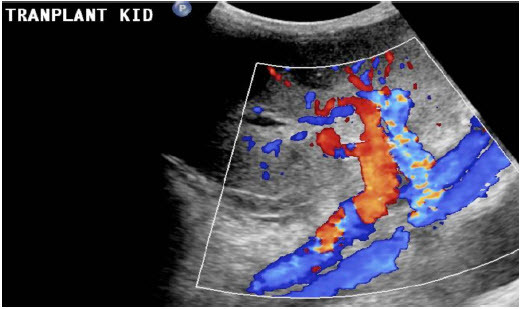 External iliac pseudoaneurysm ruptured into non-functioning intrarenal allograft abscessed mass. Nephrol Dial Transplant June 2006; 21(6):1727-1728. Asztalos L, Olvasztó S, Fedor R, Szabó L, Balázs G, Lukács G. Renal artery aneurysm at the anastomosis after kidney transplantation. Transplant Proc November 2006; 38(9):2915-2918. Brown ED, Chen MY, Wolfman NT, Ott DJ, Watson NE Jr. Complications of renal transplantation: evaluation with US and radionuclide imaging. Radiographics May-June 2000; 20(3):607-622. Yağci AB, Parildar M, Oran I, Memiş A. Interventional radiological management of vascular complications following renal transplantation. Diagn Interv Radiol December 2006; 12(4):206-210. Hegde UN, Rajapurkar MM, Gang SD, Lele SS. Percutaneous endovascular management of recurrent aneurysm of transplant renal artery anastomosed to internal iliac artery. Indian J Urol July 2008; 24(3):411-413. Taghavi M, Shojaee Fard A, Mehrsai R, Shadman M. Late onset anastomotic pseudoaneurysm of renal allograft artery: case report, diagnosis, and treatment. Transplant Proc December 2005; 37(10):4297-4299. Diller R, Hölzen J, Senninger N, Kramer S. Interventional stenting for ruptured iliac aneurysm following transplant nephrectomy. Transplant Proc April 2006; 38(3):718-720. Freyrie A, Rossi C, Cirelli MR, Tedesco A, Leone M, Gaiani S, et al. Endovascular treatment of a false aneurysm in the site of nephrectomy of a transplanted kidney. G It Chir Vasc 1999; 6:135-138. Pezzullo JA, Dupuy DE, Cronan JJ. Percutaneous injection of thrombin for the treatment of pseudoaneurysms after catheterization: an alternative to sonographically guided compression. AJR Am J Roentgenol October 2000; 175(4):1035-1040. Fornaro J, Marincek B, Jungius KP. Pseudoaneurysm in the iliac fossa after renal transplantation–treatment with ultrasound-guided thrombin injection. Abdom Imaging January-February 2007; 32(1):50-52. Reus M, Morales D, Vázquez V, Llorente S, Alonso J. Ultrasound-guided percutaneous thrombin injection for treatment of extrarenal pseudoaneurysm after renal transplantation. Transplantation September 2002; 74(6):882-884. Mohler ER III, Mitchell ME, Carpenter JP, Strandness DE Jr, Jaff MR, Beckman JA, et al. Therapeutic thrombin injection of pseudoaneurysms: a multicenter experience. Vasc Med November 2001; 6(4):241-244. Pope M, Johnston KW. Anaphylaxis after thrombin injection of a femoral pseudoaneurysm: recommendations for prevention. J Vasc Surg July 2000; 32(1):190-191. Sheldon PJ, Oglevie SB, Kaplan LA. Prolonged generalized urticarial reaction after percutaneous thrombin injection for treatment of a femoral artery pseudoaneurysm. J Vasc Interv Radiol June 2000; 11(6):759-761.